There is a large open communal area with great viewing of the surf, amazing sunsets and a place to hang out with fellow guests. 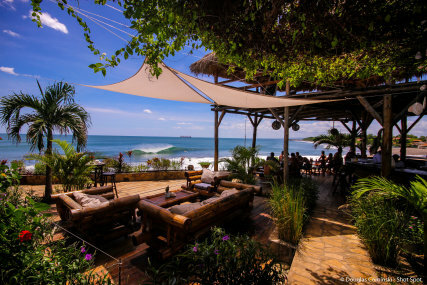 An open and breezy hammock lounge area to quietly relax and feed the soul is located on top of a training area used for surf training, yoga, meditating and Jiu to Jitsu or any other kind of personal training you wish you practise. to Off shore winds, point and beach breaks for all levels of surfers, all year round. to Uncrowded and easily accessible waves by foot or boat. to A variety of rooms for all types of holiday makers, from beach front to non ocean view . to Optional activities include volcano boarding , horse ride , kayaking, fishing ,motorbiking, paddle boarding, or tours to the city of Leon. PRICES ARE NOT INCLUDE NATIONAL SALES TAXES (IVA) 15%. The Ac Room offers a budget to friendly option if you are planning to saty longer and have more adventures.